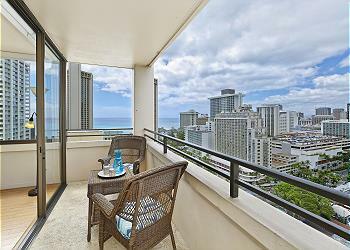 Captain Cook Resorts Waikiki Skytower vacation rental condos are located in a secure residential high rise condominium just two short blocks from the best swimming and surfing beaches of Waikiki Beach. You are one block from the Food Pantry market, Waikiki's only grocery store. Convenience stores, a pharmacy and Starbucks are all close by. There are a variety of restaurants and lots of shopping in the area. The Honolulu Zoo, Aquarium and community tennis courts of Kapiolani Park are also within walking distance. 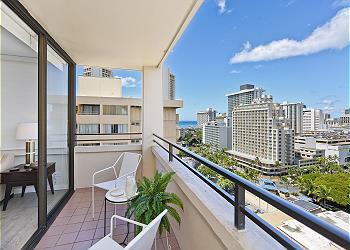 World famous Ala Moana Shopping Center is a short bus ride away from this Waikiki Vacation rental. 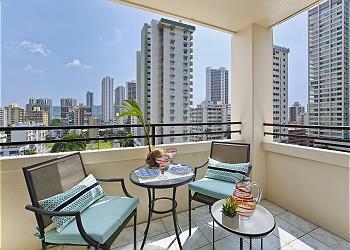 Amenities of the Waikiki condo rental include a recreation deck with heated saline pool, sauna, and 2 BBQ grills. All of Captain Cook Resorts Waikiki Skytower vacation rental condos have fabulous views - Some have direct Pacific Ocean views. 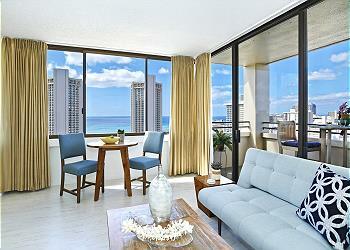 You can see the surfers at Waikiki Beach and enjoy fabulous sunsets from your ocean facing lanai. 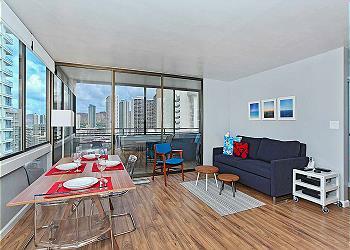 Others have breathtaking views of the Ko'olau Mountains,the Ala Wai Canal and Golf Course. 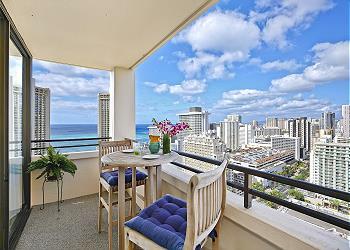 Some of these Waikiki vacation rental condos offer either partial Diamond Head or partial Pacific Ocean views. 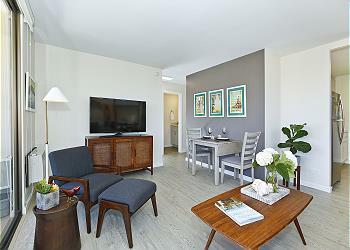 All of our one bedroom condos have over 600 square feet of interior living space and large 90 sq ft lanais - some of which have been enclosed. Renovated in 2006 these Captain Cook Resorts Waikiki Skytower vacation rental condos are spacious and bright with large floor to ceiling sliding doors and large windows that capture the surrounding beauty and bring in cool island trade winds. Kitchens have maple wood cabinets, full size refrigerator, range/oven, microwave, dishwasher and washer - dryers. Linens and dishes are provided. Most have wood floors in living area and carpets in bedrooms; kitchens and bathrooms have tile floors. There is at least one air conditioning unit in each condo as well as ceiling fans in the bedroom or living room. Included in your rates are WiFi internet connection, free local and US mainland phone calls as well as assigned covered parking. 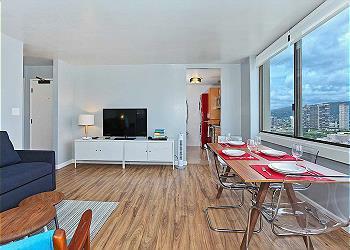 Captain Cook Resorts Waikiki Skytower vacation rental condos are the perfect place to stay if you are on a budget but want one of the finest Waikiki Beach vacation rental condo values. 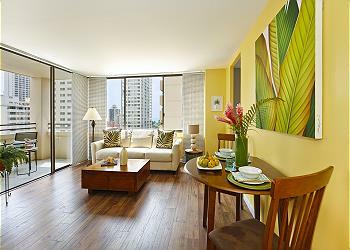 Captain Cook Resorts Waikiki vacation rentals are family friendly, non smoking accommodations.